Backed by the Purdue Research Foundation (PRF), the Back a Boiler-ISA Fund is an innovative new way to help make school more affordable for Purdue students. It's not a grant or a traditional loan — though students do make payments after graduating and securing employment. It's an opportunity to complete an education without worrying about interest rates. Purdue's income share agreement (ISA) offers an alternative to private or Parent PLUS Loans to fund a Purdue education which can be paid back with greater flexibility and freedom. Investing in Purdue students' success. The Back a Boiler-ISA Fund is a potentially less expensive funding alternative to private and Parent PLUS loans for students who need additional funding to pay for their education. Students receive funding through the program and complete the agreement by paying back a set percentage of their post-education salary over a set number of years. Providing a potentially less expensive option. An ISA is not a loan or other debt instrument. An ISA represents a student's obligation to make payments linked to a specific percentage of the student's earned income and does not give the Back a Boiler program any rights regarding his/her educational or employment pursuits. *Information based on Back a Boiler Comparison Tool. One of the ways that an ISA differs from a traditional loan is that students aren't accruing interest on the total amount funded, but most will pay back more than the principal borrowed. For example, you're a rising senior Economics major with an ISA of $10,000. Based on your anticipated salary in that field upon graduation, you pay 3.38% of your $47,000 salary for 100 months. At the end of the contract, you would have paid back $15,673, and fulfilled the terms of your ISA. How long does it take to pay back an ISA? 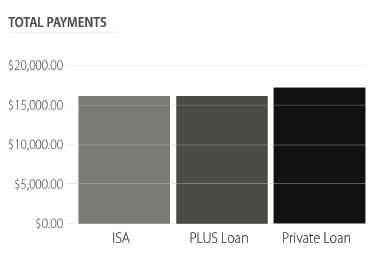 The standard payment period for the Back a Boiler-ISA Fund is about 10 years, making it competitive with most Federal Plus and private loan terms. In addition, all students receive a six-month grace period post-graduation before payments begin. Once a recipient makes successful payments for the prescribed term of the contract, no additional payments are required even if they have paid less than the amount of funding they received. Discuss the Back a Boiler-ISA Fund with your financial aid counselor and parents or guardians before deciding if an ISA is a possible funding solution for you. For more information, email BackaBoilerInfo@prf.org, or call 765-494-5050. Your individual education financing plan should include an assessment of all of the options available to you based on your individual financial situation. The Back a Boiler Comparison Tool can be used to compare an ISA to some of the other options that may be available to you.